We are fortunate that Hollingworth Lake Sailing Club not only has easy access by car (being less than 2½ miles from the motorway network) but it also has excellent public transport links. 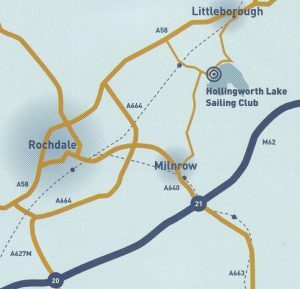 Hollingworth Lake Sailing Club is situated alongside the B6225 Milnrow to Littleborough road. From Junction 21 on the M62 (Milnrow) turn left at the 2nd (from East) or 3rd (from West) exit roundabout (which is controlled by traffic lights) towards Milnrow (A640[N]). Follow the brown tourist signs to Hollingworth Lake for approximately two miles. This entails a right turn at the next set of traffic lights (just after Aldi), a left turn at the mini roundabout by The Bobbin pub and then another left turn at the top of the hill before the Gallows pub, following the B6225. At the next mini roundabout turn right and follow the road as it swings left (by the Beach Hotel) round a corner. The Sailing Club is on your right hand side in 150 metres, with access being through the Lake Bank car park. The Sailing Club is the building between the Rowing Club and the Beach Hotel. Smithy Bridge railway station which is on the Manchester Victoria to Leeds line and the Manchester Victoria to Blackburn line is only ½ mile from the sailing club. There are frequent trains on this line and it’s only a 25 minute train journey from the centre of Manchester. Click here to view the Smithy Bridge timetable information. The Rochdale – Hollingworth Lake – Littleborough bus service (455) stops outside the sailing club and it’s about a 15 minute journey from the centre of Rochdale.